Calls for Wayne Rooney to be dropped by England at the World Cup have turned into a "witch-hunt", according to his Manchester United coach Phil Neville. The 28-year-old striker's place in Roy Hodgson's side has been questioned ahead of Saturday's game against Italy. But Neville told BBC Sport: "I just think it is a witch-hunt we don't need. "Everything has been going so well with the team's preparation that people are looking for a negative now. But there isn't a negative with Wayne." During England's preparations for the World Cup, Rooney and Neville's former United team-mate Paul Scholes suggested the forward may be past his peak. "There is a side of the English mentality to say 'let's look for a scapegoat and somebody to criticise'," said Neville. "But Wayne is our best player and that's a fact." Rooney has not scored in eight World Cup appearances, but netted four times at the European Championship in 2004. "I'm certain he will want to deliver in this tournament like he did at Euro 2004," said Neville. "He looks fit and lean and I do not understand why people want him out. "Hopefully this criticism will be Wayne's motivation. I just get annoyed by it all and it sounds like Roy Hodgson is getting annoyed by it all too." Pat Nevin analysis: Has Wayne Rooney lost his hunger? Hodgson said last week it was "a bit sad" that England is "so Wayne Rooney-obsessed". Neville, who is part of the BBC punditry team in Brazil for the World Cup, feels Rooney is being targeted unfairly. 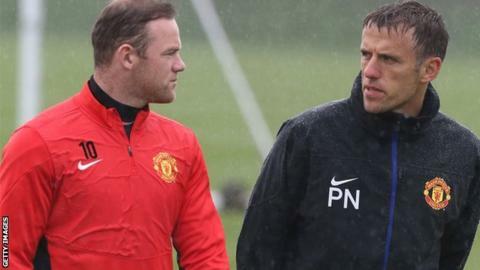 "People question Wayne's attitude as well as his fitness but I worked with him every day last season and can tell you he is totally driven to perform at this World Cup," said Neville, whose brother Gary is part of the England coaching set-up. "Part of his ambitions now are to become the all-time leading goalscorer for England and Manchester United, and that is something that is driving him on. "I know that for a fact because that is one of the goals we, his coaches at United, set him." Rooney, who scored 17 Premier League goals in 2013-14, is the third-highest scorer in United's history with 216 goals in 442 games, 33 behind record holder Sir Bobby Charlton. Charlton also holds the record for England with 49 goals, with Rooney in fifth place on 38, including the seven goals that made him England's top scorer in qualifying. Neville added: "Wayne's record in qualifying was superb, he is held in high esteem throughout the world and is the player that, when his name is on the England teamsheet, the Italian defenders will be thinking 'he is the one we have got to stop'. "Yet there is talk that we as a nation want to leave him out of our team. I cannot get my head round it. "There is no doubt in my mind that Wayne is the first name on the teamsheet. Let's just hope that he delivers and these silly rumours and suggestions go away." Phil Neville will be writing regular columns for the BBC website during the World Cup.